Anne of Cleves01644 481336work Public HouseThe Anne of Cleves in Melton Mowbray is one of Everard's most historic pubs. Built in the fourteenth century, the Priory of Lewes in Sussex, set up by Cluniac monks from Cluny in France, owned this house and it was later home to fourteen monastic priests. The Anne of Cleves in Melton Mowbray is one of Everard's most historic pubs. It came by its present name after a later owner and advisor to Henry VIII, Thomas Cromwell, fell from favour and the building was gifted to Anne of Cleves in a divorce settlement, although it is unlikely she stayed there. 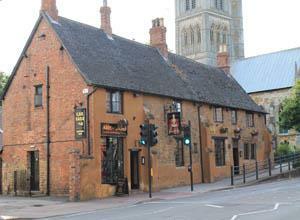 Our pub is situated directly next to St Mary’s Church in the centre of Melton Mowbray, Leicestershire. We have 40 car parking spaces to the rear of the building entering between Newton Derry Moore & The Anne of Cleves.